We have just started a much-needed renovation on our house, the addition of another bedroom (a master suite for my husband and me). We purchased this house knowing that we would need to add on to it - since I was pregnant with kiddo number three at the time. Our daughter Lola spent the first year in a mini crib in our bedroom and has been bunking up in her older brother's room for the past several months now. This is the mood board I have created for her new room. 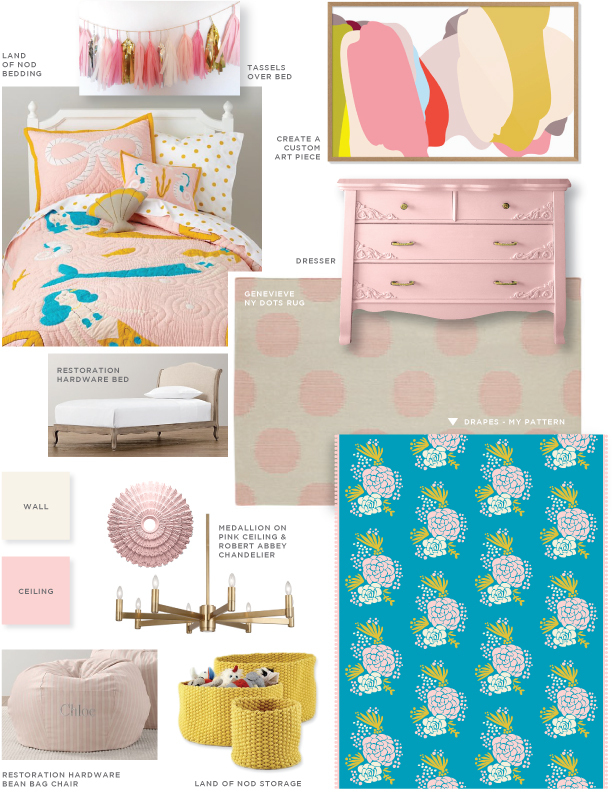 The color scheme comes directly from the adorable bedding I found at Land of Nod. How cute are those mermaids?! I plan to have a floral pattern I designed printed on fabric by Spoonflower and made into drapes for the room. They will have small, pink, pom poms on the edge of them for a youthful touch. Also, I would like to design (and/or paint) a custom piece of art for her room. I adore this modern one from ubabub - but being a designer, I would love to do something custom for her, or even get a large canvas and have Lola and her brothers paint something (they are quite talented artists). Genevieve Gorder is one of my favorite designers, and I was stoked to find out she now has a line of rugs. This one is so sweet for a little girl's room. It goes perfectly with the pink ceiling and cream walls I have planned. The dresser is mine from when I was a child, and I plan to paint it pink. I am still debating on whether or not she will stay in a crib for a while or move to a "big girl bed". She will be nearing two-years-old by the time our renovation is complete, but it may still be a little early for it. We'll see. I am so in love with the bedding and bed I have chosen that it will be hard for me to stick a temporary crib in the new space. Since I never got to plan a proper nursery for her, I am so excited that she will soon be getting a room of her own. I will post pics once it is complete....which will be months from now. The only thing I have already purchased is the bean bag, so I have A LOT to do. Until then, I will just dream of pink, teal and gold.